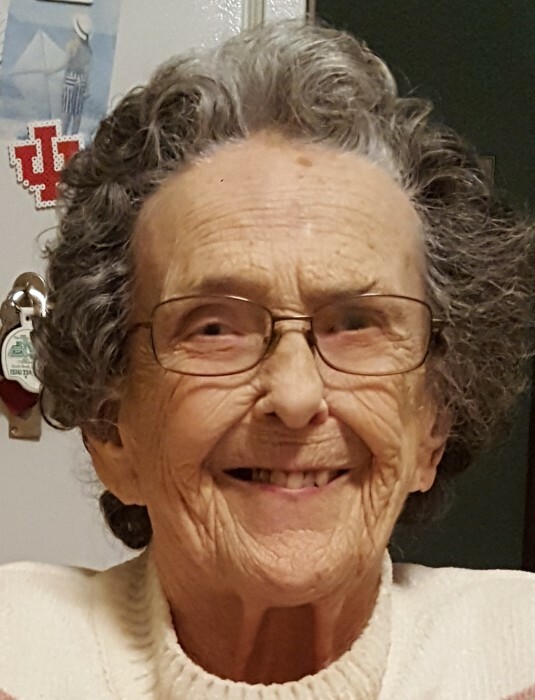 Ruth P. Hess, 93, of South Bend, IN passed away peacefully at her home with her family. She was born in Clinton County, IN on October 18, 1925 to Melvin Phillips and Clara (Merrill) Phillips. She graduated from Jackson Township High School in 1943 and moved to South Bend where she graduated from the South Bend College of Commerce. She worked as a secretary until staying at home after becoming a mother. On June 3, 1950 she married her soul mate F. Eugene Hess who preceded her in death on October 5, 2004. Ruth is survived by her two sons, Frederick (Douglas) Dempsey-Hess of Cottage Grove, MN and Philip Hess of South Bend. She is also survived by her grandson Franklin Dempsey-Hess, her sister Esther Watkins, Rossville, IN and numerous nieces and nephews. Preceding her in death were her brothers Buryl Phillips and James T. Phillips. Ruth grew up attending the Michigantown, IN United Methodist Church and held that congregation in heart as her basis for her faith. She was active in the Crest Manor Church of the Brethren Congregation for the past 69 years having taught Sunday school for many years. The fellowship of her church family was a central part of her life. Ruth retired from the South Bend Community Schools in 1990 after 22 years of employment in Food Services. She was President ofthe PTA while her sons were in school and enthusiastically volunteered where needed in numerous civic organizations, including Loyal Order of Moose Auxillary 1057, Fraternal Order of Eagles Auxillary #2083, and served as President of St. Joseph County School Food Services. She was an avid bridge player and enjoyed playing with many clubs during her lifetime. She thoroughly enjoyed playing card games around her table with family and friends. She was an avid reader, loved solving word puzzles along with being an avid sports fan following Indiana University basketball and the Cincinnati Reds. Her number one job was that of being a mother to her sons and to others she took under her wings over the years with her caring and compassionate nature. Her infectious smile will be missed by her family and friends. The family will receive friends from 4:00 to 7:00 p.m. today, Tuesday, April 16th, at Palmer Funeral Home-Guisinger Chapel, 3718 S. Michigan St., South Bend. Graveside services will be at 10:30 a.m. Wednesday, April 17, at Violett Cemetery, Goshen, followed by a Memorial Service at Noon at Crest Manor Church of the Brethren, 1342 Berkshire Drive, South Bend.